The street also played a pivotal part in the Cold War as number 19 – a couple of doors down from this house – was home to former British spy Greville Wynne, who passed information to a prominent KGB general in the run up to the Cuban Missile Crisis. Another price booster is an impressive historical provenance. This property was once part of the rear wing of Our Most Holy Redeemer and St Thomas More Church, built in the 19th century and given a Grade II Listing from English Heritage. Though it was badly damaged during the Second World War bombing campaign, vestiges of the original building are still retained in the house next door. The other factor that makes this house worth shelling out £22m for is space and this property has that in spades. This former architect’s studio actually spans three addresses from number 19 to 21. In total, it comprises approximately 7,000sqft of living space. The main living room is 2,000sqft on its own, which is larger than most three bedroom houses in London. Expansive glass windows and towering 4m ceilings add to the gargantuan proportions. 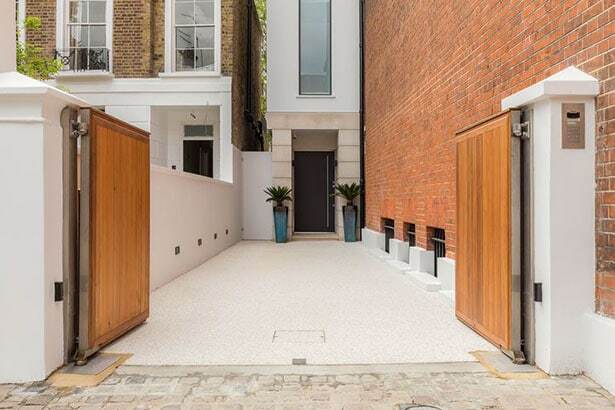 “The discreet and unassuming entrance to this extraordinary home belies the truly spectacular space that exists beyond,” says Jake Russell, director at specialist Chelsea-based estate agent Russell Simpson, which is handling the sale of the property alongside Knight Frank. “Once inside, you’re greeted with an expanse of incredibly impressive entertaining and living space that is like nothing else in Chelsea. The first floor master bedroom suite has its own staircase that leads onto a private study and roof terrace, complete with sun loungers and a sofa. The duplex bedroom also looks onto the historic church outside. Cinema fans will be pleased to know there’s a separate TV room on the first floor with surround sound speakers, while fitness fans will be taken with the lower ground floor. There’s a fitness studo, complete with ballet bannister for barre fans, as well as all the usual gym equipment. A family room on the same floor is also so generous, there’s the option to convert it into a bedroom, kitchen and ensuite for live-in staff or relatives. Four guest bedroom suites, all with large roof windows and ensuite bathrooms, reside on the first floor. Outside space is accessed via sliding doors off of the ground floor reception area, along to the East Garden and patio garden. The open-plan kitchen also has a breakfast bar with a view of the stone wall of the church. And on top of all history and modern luxury, there are also two coveted secured off-street parking spaces. See the full Russell Simpson property details here. Gardens and historical London spots! Take a peek at our beauty in Wetherby Gardens being marketing alonside @knightfrank at the moment. One remaining! Dogs PARADISE in Wetherby Gardens!